In addition to their use in detecting undesired real-time PCR products, melting temperatures are useful for detecting variations in the desired target sequences. Methodological improvements in recent years allow the generation of high-resolution melting-temperature (Tm) data. However, there is currently no convention on how to statistically analyze such high-resolution Tm data. Mixture model analysis was applied to Tm data. Models were selected based on Akaike's information criterion. Mixture model analysis correctly identified categories in Tm data obtained for known plasmid targets. Using simulated data, we investigated the number of observations required for model construction. The precision of the reported mixing proportions from data fitted to a preconstructed model was also evaluated. Mixture model analysis of Tm data allows the minimum number of different sequences in a set of amplicons and their relative frequencies to be determined. This approach allows Tm data to be analyzed, classified, and compared in an unbiased manner. Real-time PCR or semiquantitative PCR is widely used to detect and quantify specific target sequences. The exponential amplification of a sequence is monitored in real time by fluorescence. Commonly, a nonspecific fluorescent dye is used, such as SYBR Green I or LCGreen, which only reports the presence of double-stranded DNA. These dyes do not distinguish sequences and can thus report the amplification of undesired targets. Undesired sequences are normally detected during a dissociation step after thermocycling is complete. During dissociation, the double-stranded PCR products melt into single strands, so fluorescence is diminished. A curve can be produced by plotting the loss of fluorescence against a gradual increase in temperature. The temperature at which the rate of signal loss is the greatest can be defined as the melting temperature (Tm) of the PCR product. Although the Tm is sequence dependent, different sequences do not necessarily have different Tm. However, the converse is true. The detection of different Tm does imply the presence of different sequences. Therefore, by monitoring Tm, we can distinguish different targets for one set of primers. This technique has been used for the detection of single-nucleotide polymorphisms , allelic discrimination , and strain typing of microorganisms [3–5]. We previously reported the use of Tm analysis to detect the expression patterns of transcripts containing different members of the W family of human endogenous retrovirus (HERV) elements in vitro and in vivo [6, 7]. The precision of the Tm measurements determines the sensitivity with which different sequences can be distinguished. The instrument used to obtain the Tm recordings is the principal factor limiting the amount of information that can be extracted from the data. We recently reported a method that allows improved resolution, reduced spatial bias, and automated data collection for Tm detection in an ABI Prism 7000 Sequence Detection System (Applied Biosystems, Palo Alto, CA) . Using a temperature indicator probe (Tmprobe) and an algorithm (GcTm) to interpolate more-precise Tm measurements from multiple data points, the standard deviation of the measurement error (σ) of the Tm recordings was improved from 0.19°C to 0.06°C . However, there is no convention on how to analyze Tm data to objectively distinguish sequences by Tm. The need for such a tool becomes apparent when the Tm data are: i) not easily stratified because of overlapping clusters of Tm observations, and/or ii) if the number of different sequences and possible Tm categories are unknown. In this report, we use mixture model analysis to construct a model for a particular set of primer targets, to classify Tm data, and to calculate the mixing proportions of the amplicons within these categories. The mixture model technique allows Tm analysis to be applied to any set of primers to determine the minimum number of Tm categories (i.e., the number of different sequences detected) and the mixing proportions (frequency distributions) of the detected categories. Thus, mixture model analysis of Tm data is an objective method with which more refined Tm assays can be established. In a Tm analysis using the Tmprobe and GcTm program, described previously , we demonstrated, using plasmids containing known sequences, that it was possible to distinguish some but not all sequences based on their Tm. In the present report, we applied the mixture models and the ρ established in the previous publication  to determine the Tm categories and mixing proportions of these data (Figure 1). Akaike's information criterion (AIC), a measure of how well a model explains the data, with a penalty for the number of parameters estimated, determined that the Tm of the four sequences were best represented by a three-category mixture model. This model precisely estimated the mixing proportions of the Tm into the categories, attributing the correct number of Tm recordings to each of the four sequences (where two of them shared a category). For an overview of the procedure for using mixture models to analyze Tm data, see the Methods section. T m profiles for four individual plasmid targets with known sequences and their analysis in a mixed population by mixture model analysis. Box and whisker plots represent the Tm (median and range) of the four known sequences amplified separately. Dot plot shows the mixed population of the four Tm groups. Horizontal bar graph and Gaussian curve plot represent the grouped raw data of the Tm and the categories, respectively, with mixing proportions determined by mixture model analysis. The mixture models determined the mixing proportions of the three categories to be 15, 24, and 16, which exactly matched the proportions of the different sequences used. We next assessed the performance of the mixture model analysis in constructing models for categories of Tm with varying separations. Therefore, we generated simulated data points mimicking the Tm of four sequences separated by multiples of σ. These data were used to identify the model that best explained the data according to AIC (see an example of the AIC plot in Figure 2) for a range of Tm separations and numbers of data points (Figure 3). A large separation of Tm, 10 × σ (0.6°C), allow the mixture model analysis to close in on four separate categories with only 10 data points. Smaller separations of Tm require larger numbers of data points to determine the correct number of Tm categories. The distinction of categories with a separation of 1 × σ required approximately 2000 data points to model the correct number of Tm categories. AIC plotted for models with various numbers of categories. This AIC plot corresponds to 100 data points generated from four temperatures with 5 × σ separations (80, 80.3, 80.6, 80.9). The minimum at four indicates that a model with four categories is optimal. Models with 1–3 categories have a high AIC, indicating that they do not sufficiently explain the data. 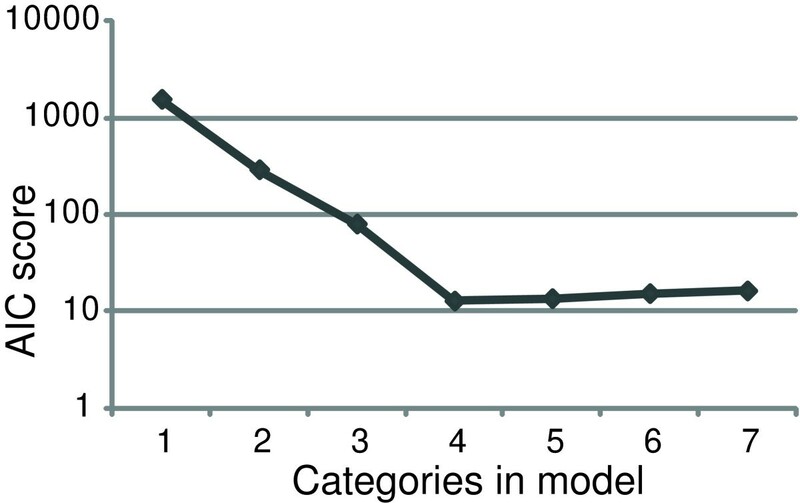 Models with 5–7 categories do not improve the correlation of the model to the data points sufficiently to justify the additional parameters estimated. Plot of the optimal model, as defined by AIC, for simulated data consisting of four T m with varying separations against the number of T m used to construct the model. Y-axis labeled "Tm categories" indicates the number of categories in the model determined to be optimal by AIC. X-axis indicates the number of simulated Tm data points used in the construction of the model. Z-axis indicates the separation of the Tm (multiples of σ) used to generate the data points. Next, we evaluated the fit of the data points to preestablished models. For this purpose, we generated data points corresponding to a sample containing three of four possible Tm represented in a model. We compared the mixing proportions reported by the mixture model analysis with the mixing proportions in which all four Tm were present at equal frequencies. In Figure 4, the P values obtained from χ2 analyses for various separations of the Tm are plotted against the numbers of data points used. The P values for the χ2 test drop rapidly with increasing sample numbers for any Tm separation of more than 1 × σ. With smaller separations of the Tm categories, the mixture model analysis is unable to reliably establish the differences in the mixing proportions. Plot of P values determined with χ 2 tests against the number of data points fitted to the mixture model. χ2 tests between four equally proportioned Tm categories were compared with the fitted mixing proportions determined from data points when one of the four categories was not represented. The different lines represent the various separations of "temperatures" used to generate the data points, where each line is denoted by a multiplier of σ. We report the application of mixture models to the analysis of high-resolution Tm data. Whereas the plasmid Tm data reported are sufficiently separated to be stratified manually, we use these data to demonstrate the principle that can be applied to analyze more complex Tm data. Mixture model analysis of Tm data entails the construction of a model based on the Tm data for a set of primers. With such a model established, it is possible to fit smaller subsets of data to calculate the mixing proportions of the Tm categories of the model. This gives a proxy marker for the frequency distributions of different amplicon sequences in the analyzed data. This approach requires no prior knowledge of how many different amplicons are present and there is no limit to the number of different Tm that can be distinguished. However, the Tm analysis method with mixture models only reports the minimum number of different sequences required to explain the Tm data because different sequences can have the same Tm. Mixture model analysis is a modern type of cluster analysis. The purpose of cluster analysis is to group data that have properties in common. When constructing the mixture model for a set of primers, the number of categories in the model that most appropriately explains the Tm data is determined by AIC. Other information criteria exist, such as the Bayesian information criterion, but this penalizes free parameters more harshly than does the AIC. By empirical testing with simulated data, we found that smaller separations of Tm require exponentially larger numbers of data points to distinguish the correct number of categories in a mixture model. 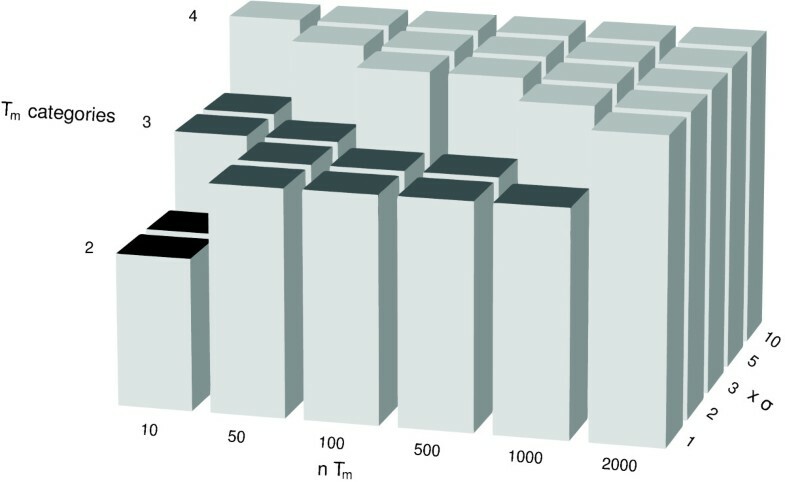 Insufficient numbers of observations yield an underestimation of the numbers of unique Tm represented by the data, erring on the side of safety. In other words, with insufficient data, the number of unique sequences in the data is underestimated by the optimal model. In an established model, based on a large number of Tm observations, a smaller number of observations can be fitted to calculate the mixing proportions in the Tm categories. These proportions can then be compared between sets of Tm data as frequency distributions of sequences and analyzed with χ2 tests. We observed that, whereas a large number of Tm observations are required to establish a model with a small separation between categories (e.g., 1000 data points are required with 2 × σ separation), far fewer are sufficient for comparisons once the model is established (e.g., 100 data points for P < 0.001). A separation of the Tm categories in the model of less than 1 × σ results in unreliable mixing proportions. However, this should rarely be a problem in practice, because constructing the models puts a larger constraint on Tm separation by AIC. In other words, models constructed with mixture model analysis will consist of Tm categories separated by more than 1 × σ. Not all dissociation curves are easily defined by a single Tm, as in the case of multiple domain transitions in longer sequences  (generally longer than those generated in real-time PCR assays) and for heterodimers. Using the GcTm approach to curve fitting and SYBR Green I chemistry, such melting profiles will be assigned a single Tm value. Although some additional information is therefore lost, mixture model analysis still validly identifies clusters of Tm and sequences. There is an established high-resolution amplicon melting analysis (usually denoted HRM) using LCGreen, primarily based on differences in the profiles of melting curves rather than on absolute Tm . Although this method is superior to mixture model analysis in identifying heterodimers, absolute Tm values are required to identify homodimers. Recently, a method with sufficient resolution to distinguish base-pair neutral homozygotes was reported . Mixture model analysis of Tm can be used in all cases where the Tm can be denoted as a single value, but primarily for homodimer discrimination. In conclusion, the mixture model analysis of Tm presented here allows the unbiased analysis of high-resolution Tm data. This analysis is applicable to the identification of sequences in Tm data regardless of the method by which the Tm are acquired, provided the measurement error is known. Mixture models allow Tm analyses to be performed on more complex and varied sequence targets than hitherto possible. Possible applications include typing microbial strains and their relative abundances in a population and the analysis of transcripts containing repetitive elements [3, 4, 6, 12]. Mixture models are useful for describing complex populations with observed or unobserved heterogeneity. The term mixture model encompasses many types of statistical structures. Here, we use it to denote mixture distributions. A mixture distribution is a collection of statistical distributions that arise when mixed populations are sampled that have a different probability density function for each component. where 0 ≤ π i ≤ 1, i = 1, ..., k, π1 + ... + π k = 1. Such a model can arise if one is sampling from a heterogeneous population that can be decomposed into k distinct homogeneous subpopulations, called component populations. If these components have been "mixed" together, and we measure only the variable X without determining the particular components, then this model holds. We say that X has a finite mixture distribution and that g(·) is a finite mixture density function. The parameters π1,..., π k are called mixing weights or mixing proportions, and each π i represents the proportion of the total population in the i- th component. There is no requirement that the component densities should all belong to the same parametric family, but in this paper, we keep to the simplest case where f1(x),..., f k (x) have a common functional form but different parameters. where ψ = (π1,..., π k , μ1,..., μ k , σ) T .
Quite often, the log likelihood function cannot be maximized analytically, i.e., the likelihood equation has no explicit solutions. In such cases, it is possible to compute the maximum likelihood of ψ iteratively. To calculate maximum likelihood estimates, we use the expectation maximization (EM) method in combination with the Newton-Raphson algorithm. Iterations of the EM algorithm consist of two steps: the expectation step or the E-step and the maximization step or the M-step [13, 14]. The Newton-Raphson algorithm for solving the likelihood equation approximates the gradient vector of the log likelihood function by a linear Taylor series expansion . We use the Newton-Raphson algorithm in the M-step of the EM method. We developed an algorithm that allows the automated estimation, in parallel, of a finite number of normally distributed components. The number of components can be assessed by several different methods, although none of them is optimal. We chose the AIC [16, 17]. AIC is a relative score between different models where the selection of the optimal model is made by considering the number of data points and categories and the separation of the Tm categories. AIC is defined as -2L m + 2m, where L m is the maximized log likelihood and m is the number of parameters. Tm data were generated with GcTm, as previously described , on dissociation data obtained from the amplification of plasmids containing known HERV-W gag sequences. Simulated Tm data recordings and GcTm analysis were performed in MATLAB™ (The MathWorks) version 7.0.1.24704 with the Optimization Toolbox. Mixture model analysis was performed in R 2.6.0  with the MIX software [19, 20]. A mixture model is constructed for a set of primers. The model should be constructed on a large enough sample of Tm data to expect all possible sequences to be represented. The Tm data are then stratified into small-interval groups and the frequency distributions of these arbitrary categories are used to construct and compare the mixture models. AIC is used to evaluate which model best explains the data, while a minimum number of different categories is used. Lower values of AIC indicate the preferred model, i.e., the one with the fewest parameters. Once a model is selected, Tm data from different samples can be fitted to the model and the mixing proportions compared between samples. 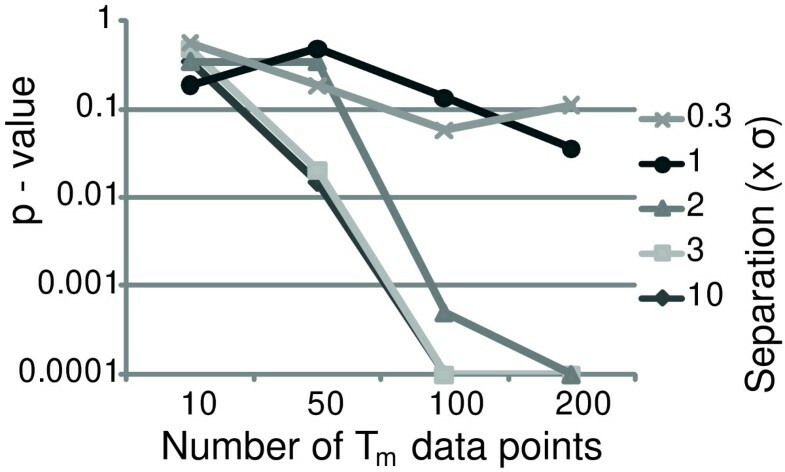 Differences between samples can be evaluated with χ2 tests if a conservative stance is taken, depending on the separation between the Tm categories and the numbers of data points. This study was generously supported by the Stanley Medical Research Institute, Bethesda, MD, and the Swedish Research Council (21X-20047). CN conceived the study, tested and prepared the manuscript; FU developed the method and critically revised the manuscript; JT developed the method and prepared the manuscript; HK conceived the study and prepared the manuscript.